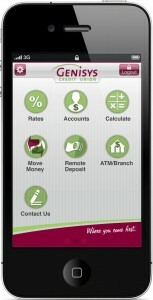 FOR IMMEDIATE RELEASE—August 22, 2012—ANN ARBOR, MI—Logic Solutions and Genisys Credit Union are pleased to announce the launch of the Genisys Mobile Banking app for Apple devices. The app enables credit union members to check balances and view transaction history, transfer money between accounts or to any Genisys member, deposit checks, view rates, use calculators, and search for ATM and branch locations. Security is the central feature of the Genisys application. Fully encrypted and equipped to guard against unauthorized access, Genisys Credit Union members enjoy ease of use and peace of mind when banking with their iPad or iPhone. Genisys Credit Union is one of the largest credit unions in Michigan with 132,000 members and over $1.4 billion in assets. Genisys Credit Union partnered with Logic to create a world-class mobile banking experience that helps deliver greater convenience and increased loyalty. Genisys Mobile Banking is available free in the App Store. Genisys and Logic Solutions look forward to the release of an Android version later this year. For more information, visit https://www.genisyscu.org. Founded in 1995, Logic Solutions, Inc. is a privately held minority-owned corporation with headquarters in Ann Arbor, Michigan. Logic provides technology solutions and services, including custom mobile strategy and application development, web applications, and comprehensive websites. Logic’s development expertise is evidenced by its impressive portfolio of technologically sophisticated B2B web and mobile apps developed for companies in a wide array of diverse industries.